We may be back in World War 1 for DICE’s new multiplayer blockbuster, but Battlefield 1 still relies on good old class-based warfare to keep its gears turning. Things have changed a little since your last tour of duty though, so we’re here to help you with some basic training for each of the classes. Fix your bayonets and load your magazines – it’s time to hit the range. Looking to pwn online? Pick up one of the best multiplayer games on PC. 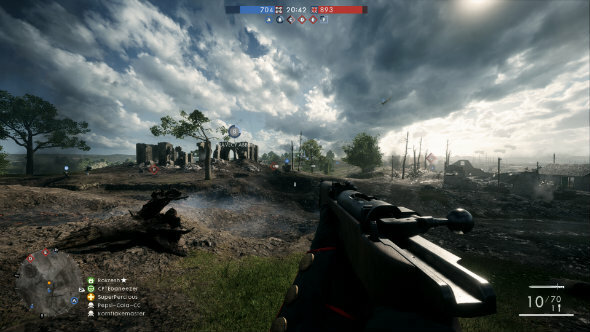 Battlefield 1’s classes are defined by their weapons and gadgets. Each class uses a different, specialised category of weapons. They are also equipped with a sidearm, one of numerous grenade types, and have a melee weapon for close encounters, which are all picked from a pool shared between every class. On top of this they can carry two role-specific gadgets. Several gadgets are unlocked at the start of the game, but each class has a few that need to be purchased with war bonds, which are earned by levelling up. The Assault is a close-up, damage dealing soldier designed to quickly punish the enemy with storming tactics. Their primary attacks come in the form of short to mid-range submachine guns and shotguns. Assault players are also armed with a sidearm pistol and a grenade, making them a fairly rounded soldier class. It’s their gadgets that make them notably more specialised, though. Tanks may have been less common in WW1 than modern conflicts, but they’ll still be there to mince you up in Battlefield 1. To remove armoured threats you’ll need to rely on a savvy assault player armed with anti-tank solutions. The anti-tank grenade is a heavy, thrown explosive that will detonate upon impact. They inflict huge damage but, due to their heft, require a good arcing swing. The blast radius is large, so you’ll need to practice getting that throw right so you can stay far enough away that you don’t get hurt. If you’re less confident with the AT grenade, you can opt for the AT rocket gun: a single-shot weapon that can damage vehicles at long range. It’s an unwieldy drainpipe of a gun, and as such requires mounting before it can be fired, either on a windowsill, low wall, or prone on the ground. Get in a safe position though, and it’s certainly an easier option than the grenades. For a more static attack, the Assault class can use dynamite charges or anti-tank mines. These will be familiar to anyone who’s played Battlefield before; AT mines must be placed on the ground and explode when driven over, while dynamite works identically to C4 in that it must be placed and then manually detonated. The dynamite is more versatile than the mines since you can affix it to pretty much any surface, but both demand that you consider where the explosive is placed for maximum efficiency. Think about where tanks and enemies typically gather, or locations where you can catch them off guard. Due to their heavy emphasis on explosives, Assault should be considered an anti-tank class more than the general purpose soldier the role has typically provided. If your team is struggling against enemy armour, then spawning as an Assault is the way to break through the lines. Their quick-firing weapons means they’re also a great counter against snipers, provided you can close in on them. 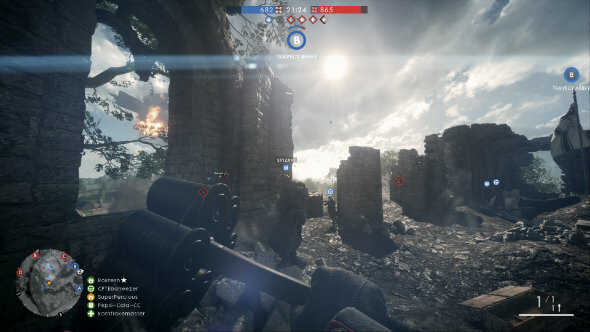 After being absent for a few Battlefield games, the dedicated Medic class has returned for Battlefield 1. It’s in a wholly new guise now, armed with a variety of self-loading rifles to make it a very proficient mid-range rifleman. The extra range and accuracy afforded by these guns makes them a great foil for Assault and Support troops, provided you can avoid being suppressed by their fully automatic weaponry. Loading times on the rifles can be long-winded if they’re fed from stripper-clips rather than magazines, but you can get yourself out of a pinch with a sidearm pistol. The Medic is, naturally, outfitted with items to help heal allied players. Medics can see how healthy other teammates are by checking the little symbol above their heads: if the circle is not completely full, they need topping up with HP. To do so, Medics have two options: the small bandage pouch or the group-heal medical crate. The crate can be slammed down on the ground, and nearby soldiers will begin to heal thanks to area-of-effect magic. The bandages are given to just a single ally to bring them back to full health at a rate of 12.5 HP per second. If you place your crosshair over a damaged ally, pressing Q will quickly throw a bandage pouch at them. If you fail to make it in time to a sick buddy, you can bring them back to life with the medical syringe. Recently deceased players will appear on the map as a skull symbol, and a dose of the syringe’s magical formula will have them back on their feet. Dead players can see how far away nearby Medics are, so if you’re in the vicinity try and make your way towards them. If there are no Medics close by, dead players can choose to respawn from a base instead. As with all drugs, the syringe can also be used as an offensive weapon to overdose an enemy player. It’s certainly an interesting alternative to a bayonet. Should you not want to spend all your time worrying about the health of your comrades, you can impact the wellbeing of enemies with rifle grenades. Slotted into the barrel of your gun, a shot will send these grenades flying towards your target for a quick blast of terror. They come in three flavours: frag, high explosive, and smoke. The first two are great against infantry and vehicles respectively, while smoke is useful for covering allied advances on objectives. With gadgets like these, the Medic is very clearly a support class and should be used to keep your buddies in the fight first and foremost. Having a great, well-rounded weapon can make the class feel like it’s designed to be a fighter, but healthcare is your prime directive. The grenades and rifle are just an added bonus that makes the Medic one of Battlefield 1’s strongest classes. Keeping a soldier healthy is one thing, but without bullets they’re useless. That’s where the Support class comes in: it’s a heavily armed variant that brings a variety of ordnance to the battlefield. These are the guys who will keep you stocked up with ammunition, so if you’re playing Support be sure to be on the frontline where the action is hot. The Support uses light machine guns; rattling bullet-spewers that have big magazines and even bigger bullet spread patterns. What they lack in accuracy they make up for in suppression; sustained fire at an enemy’s location will make it difficult for them to break cover. As a Support you’re likely to rack up points from assists and suppression, so be sure to blend your team with other classes who can accurately perform the killing blow. Support LMGs tend to have long reload times, so you may need to quickly swap out for your sidearm pistol in tense fights. Ammo replenishment works in a similar manner to healing. There are two options: ammo crates and ammo packs. Like the Medic’s gear, a crate will provide stationary area-of-effect replenishment to numerous allies, while the pack is a smaller bonus for just one target. Like the bandages, ammo packs can be thrown at a target with Q if they’re in need of bullets. Be sure to check out allied HUD indicators too, which deplete in colour if someone is running low on ammo. Aside from keeping allies topped up with bullets, Supports are expected to tear into the enemy, too. You can effectively do this with the mortar, which fires explosives over very long distances. It requires setting up and you’ll be stationary while firing, so find somewhere safe to use it. You target an area using the mini-map, so you’ll be able to see spotted units beyond your line of sight. Just remember that the mortar needs to fire its shell up into the air and then have gravity pull it back down again, so time your shots accordingly. Mortar shells come in two varieties: the high explosive, which creates a huge blast on impact, and the air burst, which erupts a few meters above the ground for effective infantry shredding. If you’d rather get up close and personal with a vehicle, the limpet charge is just the ticket. Its magnet clamps onto vehicles, and the timed fuse means you need simply just slap and run for the fireworks. Rather patch vehicles up than reduce them to rubble? Then the repair tool is what you need. A hammer/wrench combo, a few hits with this on an allied vehicle will replenish its HP, while using it on an enemy with have the reverse effect. The Scout is Battlefield’s long-range role and broadly replaces the Recon class from the last few games. They can make use of a variety of bolt-action and lever-action rifles which all excel over distance, but require manual reloads after each shot and are near-impossible to accurately fire from the hip. Panic situations can be remedied by a sidearm pistol, but as a Scout you’ll want to be well out of the way of action hotspots. Your rifle takes ‘regular’ bullets, but should you be hunting bigger targets you can load in K bullets instead. These armour-piercing rounds will obliterate infantry and even punch a hole in vehicles, but they’re best used against Elite enemies: players who have special weapon pickups that equip them with heavy personal armour and serious firepower. Only five K bullets are available per life, so make sure your aim is true. The trench periscope is a spotting device that helps you identify enemies without exposing yourself. It’s a telescope that can look above cover thanks to handy mirrors (the wonders of 1900’s tech), so just hide behind something and whip it out. If you’re stuck for cover, the sniper shield is your friend. It can only be used prone, but when lying down it provides a metal shroud around your barrel so you can fire without taking damage. If you’re struggling against other Scouts, the sniper decoy can draw enemy fire and allow you some time to strike back. It’s a dummy that other players will mistake for an enemy sniper, so while they’re trying to score a headshot on that you can eliminate them from a new position. Enemies that shoot the decoy will be spotted on the map, so it’s a useful little gadget to have in your sniper nest arsenal. 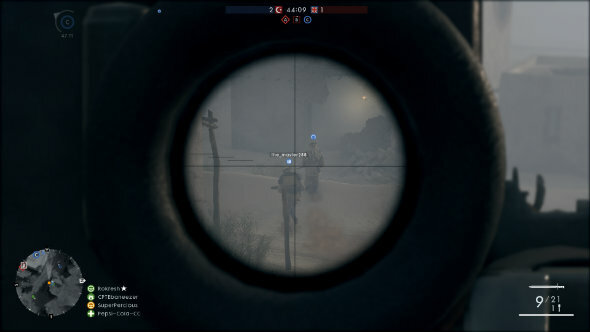 A sniper spends most of their day looking through a scope at far distances, so you may want to protect yourself from enemies sneaking up on you with the tripwire bomb. Set it up on a route that leads to you and not only will the blast take out your assailant, but it will also warn you that you’ve been found. Tripwires are also good for booby-trapping doorways and objectives you’re defending. They’re available in three deadly varieties: explosive, incendiary, and gas. Finally, the Scout’s extensive gadget collection is complete with the flare gun. It’s available in two flavours: a spotting flare, which when fired identifies targets and shows them on the minimap, and a flash flare, which works kind of like a flashbang grenade. Firing a flash flare directly at a person can damage them too, so have fun with that. In the biggest change from traditional combat roles, Battlefield 1 introduces the Tanker and Pilot. You can only play them if you spawn in the appropriate vehicle, and they mostly rely on their tank or plane to fulfil their role in the battle. If they’re forced to abandon their vehicle though, they can function as soldiers on the ground. Tankers and Pilots use carbines as their primary weapons, which in the 1910s era refers to a collection of pistols with stocks. This means vehicle classes have notably weak firepower and very short range. 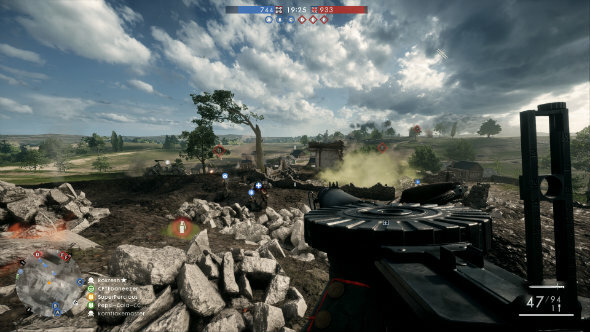 The most notable weapon that can be unlocked for the Tanker and Pilot is the sawn-off shotgun, which offers a more deadly option, albeit at close quarters. A sidearm pistol is available, but there’s only one to choose from and you’ll need to unlock it. Both the Tanker and Pilot have access to the repair tool, which is identical to that wielded by the Support. It can bring a vehicle back to full health if you hit them for long enough with it, but the Tanker and Pilot can also fix vehicles from inside. 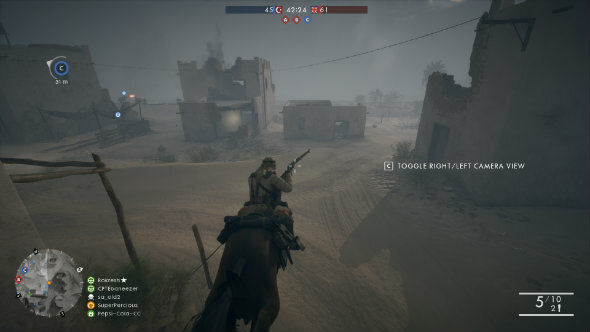 This is a new feature for Battlefield 1, and certainly makes up the lack of a dedicated engineer class. Self-repairs from inside a vehicle are far slower than those done outside, but it can help you stay on the move without having to expose your fleshy body to the horrors of combat. You do need to stop controlling your vehicle to self-repair though, which is fine in a tank, but in a plane cutting the engine equals falling out the sky. It’s certainly a trickier arrangement for airborne chaps. In the second gadget slot, the Pilot uses the flare gun. It’s the spotting variation of the gadget, so firing a flare will identify targets and plot them on your mini-map. The Tanker is equipped with AT grenades instead, which are useful should your main AT weapon (namely your tank) be seized away from you. A midway point between the vehicle and standard classes, the Cavalry is a horseback-riding soldier who can reach objectives with great speed thanks to his hoofed friend. Armed with a cavalry sword, the Cavalry can cut down enemies with a single swing. The blade and horse are the only unique items for the Cavalry class though: everything else is borrowed from other roles. 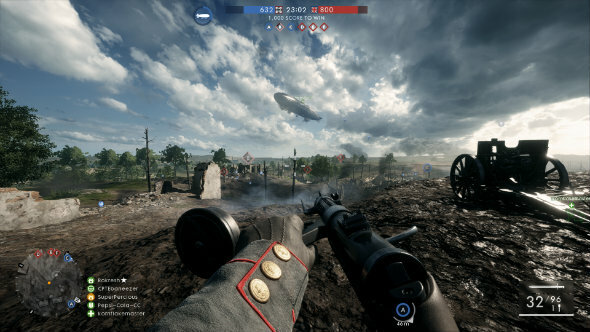 Cavalry’s main weapon is the Russian 1895 lever-action rifle, borrowed from the Scout class, while the P08 pistol sidearm is that used by the Tanker and Pilot. Gadgets come in the form of the bandage pouch and ammo pack from the Medic and Support respectively, and the only grenade available is a lighter variant of the Assault’s AT grenade. It may sound like the Cavalry is a very limited class, but it’s actually one of the most fun to play. The horse is fast (although not the most nimble vehicle), and when on the ground and able to aim correctly, the rifle is a fantastic mid-range gun. The limited support options granted by the bandages and ammo make you a help in a pinch, and you can aid in tank battles with the grenade, too. Not truly great at anything, but one of Battlefield 1’s most rounded classes. The fourth new class for Battlefield 1 is the Epic, which is accessed by picking up special weapons in-game. There are three different epic weapons: a huge water-cooled machine gun, a flamethrower, and an anti-tank rifle. When using these weapons you’ll be encased in thick armour, essentially turning you into a WW1 space marine. You’ll be able to take numerous hits before dying, and deal out more damage than any other class is capable of. Elite classes are defined by their weapons rather than their gadgets, making them direct opposites to the standard classes. In the two gadget slots for Elites you’ll find an AT grenade and the baffling inclusion of the trench periscope, which seems completely unnecessary considering the practically walking tank-like nature of Elites. 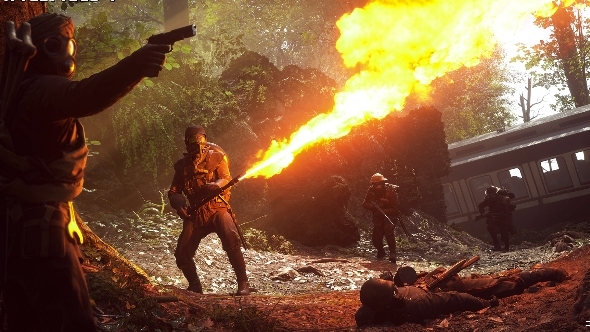 Through war bond purchases you can also equip Elites with a sawn-off shotgun sidearm and grenades, not that they can compare with the searing flames of the WEX flamethrower or the incredible fire-rate of the water-cooled machine gun. Where’s the Engineer class in Battlefield 1? You may have noticed that Battlefield 1 is missing a classic role: the Engineer. Traditionally BF games have always featured a class that worked as a vehicle-focused soldier equipped with a rocket-launcher to destroy armour with, and a welding tool to repair friendly tanks. 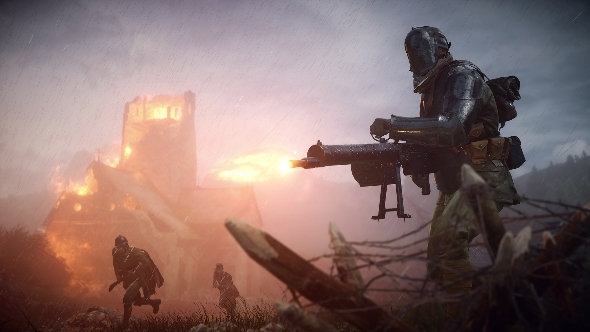 In Battlefield 1, that role is no more, but those tasks are still part of the game. As for repairs, the Tanker and Pilot classes are expected to perform maintenance on their own vehicles. They both come equipped with a repair tool, and can fix their tank/plane from both inside and out. If they require an extra hand, then a Support class can provide maintenance with their own repair tool. 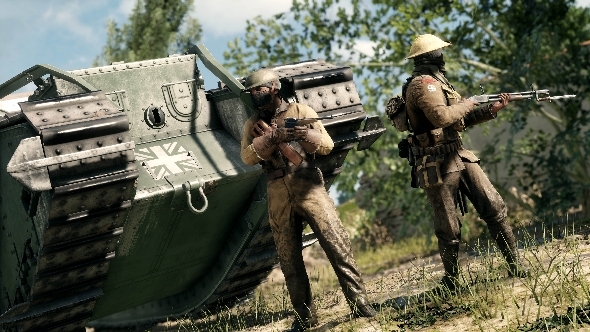 It’s a change that may take some getting used to for Battlefield veterans; anyone who mains an engy will usually rack up points from both attacks on enemies and repairs for allies. Now that job is split across two classes, and the core AT class is solely an offensive role. But breaking the status quo is part of Battlefield 1’s appeal, and it doesn’t appear that the game’s lack of engineer is a bad move. That’s our Battlefield classes 101 lecture complete. Got any advanced techniques you’d like to share? Why not pop your tactics in a comment?